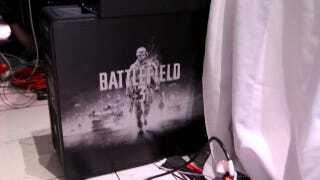 The rig DICE game developers used to run Battlefield 3's debut live gameplay demo yesterday, as seen at the game's showcase event in San Francisco. And as a bonus, their mousepad. Read our impressions of Battlefield 3. Watch the latest trailer.